Journeys 2011 1st Grade High Frequency Words Activity Pack - FREE Lesson 1! 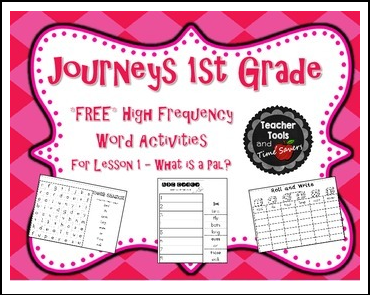 Make High Frequency Word practice fun with these fun activities to use with Lesson 1 in the HMH Journeys first grade reading series. These activities can be used for the whole class over the week or can be used on one day as a differentiated center with one activity for low (roll and write), on level (unscramble), or advanced (sentences) students. Advanced students may be able to complete sentences and another activity during the center. Copyright © 2014 Teacher Tools and Time Savers. All rights reserved by Teacher Tools and Time Savers. This product is to be used by the purchaser only. Copying for more than one teacher, classroom, department, school, or school system is prohibited. This product may not be sold, distributed, or displayed digitally (in part or in whole) for public view. Failure to comply is a copyright infringement and a violation of the Digital Millennium Copyright Act (DMCA).